workshops, knit and crochet classes. Current classes are described at bottom of page. 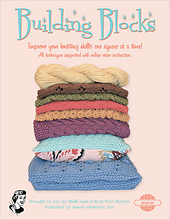 Beginners and Beyond Knit and Crochet. This is a choose your own project class, you can learn to knit socks, fair isle, intarsia, entrelac, lace, or whatever you like, in our classes, so get your name and deposit in now to hold your place, Max 6 students. 604-275-1239. If you want to learn to Knit or Crochet, you can do that in this class. Edita can also teach the Building Blocks, Building in Color and Building With Lace in these classes, see info at bottom of this page. Please note that beginners get a ball of yarn and needles to practise with, and when you choose to make anything, you will get a 10% discount on all class purchases, students are expected to purchase their yarns at Wool & Wicker. We have a wide range of weights, yarn content, and prices. Fees must be paid in advance, we take Visa and Mastercard, or post dated personal cheques. Maximum of 6 students, Minimum of 4. Students receive 10% on all regular priced items purchased while in class. If you have to miss a class, you can make up with Edita or Sarah on their class dates. The current dates are as follows. If you wish to make up or drop in ($20 fee for 1 class) please call ahead to be sure of room. Beginner and Beyond Knitting and Crochet, Wednesday night class with Edita April 10, 2019, from 7-9PM $110 for 6 weeks. and Saturday afternoon April 13, 2019, 2-4 PM. $110 for 6 weeks. If you are interested, make sure to get on the wait list, as there is almost always something coming up that will prevent at least 1 student from making it, you know life happens when we are making other plans! Sarah is offering some project based classes, but if you are interested in the Building Classes, let us know, and we can accommodate, we just need 4 students minimum to run a class of your choice. We have 1 spot left, as of April 4th. Sarah's finished sample, "Candle Flame" scarf by Brioche expert Nancy Marchant, reknowned for her several knitting books featuring Brioche, Knitting Fresh Brioche, Leafy Brioche, Knitting Brioche, 141 patterns on Ravelry, and 50 years of knitting and designing experience. 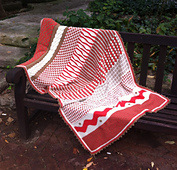 Sarah used 2 skeins of 175m/100g of the amazing Hikoo "OH!" on a 5 mm needle. The yarn is a bulky super baby alpaca, the softest and highest quality pick of the fiber, produced in a knitted tube. With Nancy's permission, we will purchase the Ravelry pattern for each student on Ravelry, and include the cost in the class fee. 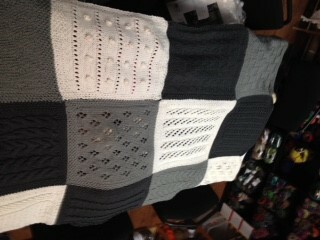 The pattern is part of her Candle "Lapghan" pattern. You need 1 skein each of 2 contrasting colours.We highly recommend students use this yarn as well, you will not be dissappointed. Come in and squeeze the double ooh! yarn needle (bodkin), note paper and pen, bring the chart enlarged and you will colour code the chart with markers. This class will cover: 2 colour cast on, 5 stitch increase, right leaning decrease, left leaning decrease, correcting mistakes, easy methods to keep track of pattern. Or her 2 socks at a time on 2 circular needles workshop with her Skacel pattern modified. If you can't make a class, we have other classes different days or evening in which you can make up. OR Building in Color class with 3 colours and 24 skeins of Hikoo Simplicity if you are a more experienced knitter who wishes to learn colorwork. This is a 12 week class. $260. 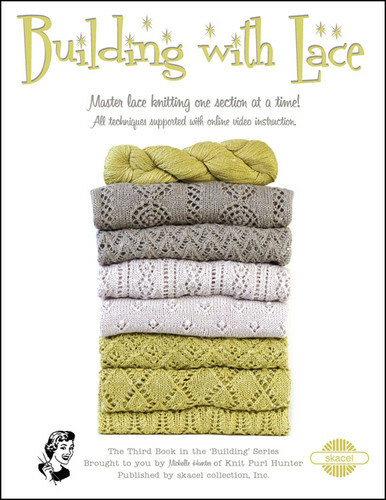 Building with Lace is the third class project book from reknowned knitter and teacher, Michelle Purl Hunter. 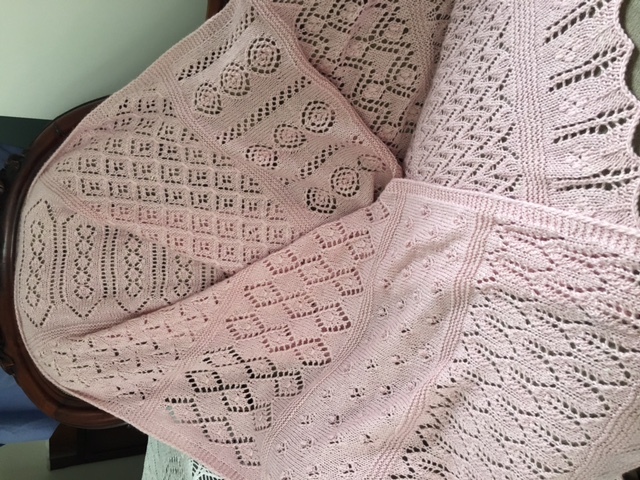 It is a carefully designed sequence of patterns that introduce knitters to lace work starting with the basics and working towards more difficult patterns. This work follows the same format as Michelle’s earlier books, Building Blocks and Building in Color , and has been a long awaited addition to this educational series. Video support is offered on her website as well. This is a 10 week class.$195. Call now and make a deposit on a class of your choice. You will love the results! 604-275-1239.